I love the Faux Iris Folding Technique from the June TJNL- as it's much quicker than regular Iris Folding, and when you have a punch - it even goes faster! The Star opening on my card was created using the new Movers & Shapers Punch Windows Die from Stampin' Up! This die was available to demos to preorder and will be available for purchase in the Idea Book & Catalog in July. What's cool about this die, is it coordinates with the Movers and Shapers Curly Label Die, as will as some of Stampin' Up! 's punches! The sentiment is from the soon to be retired Stampin' Up! set The Free and the Brave. 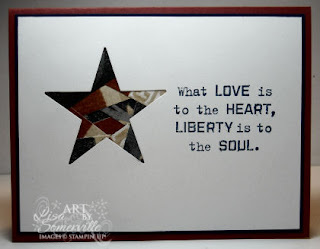 The DSP is from Karen Foster and can be found at Innovative Stamp Creations. I'm not sure exactly why but this card takes my breath away. The combination of simplicity, subtle color and sentiment just grabs my soul. This would be so perfect for Cards for Heroes and so many other special uses. Thanks for sharing this and making my day Lisa.